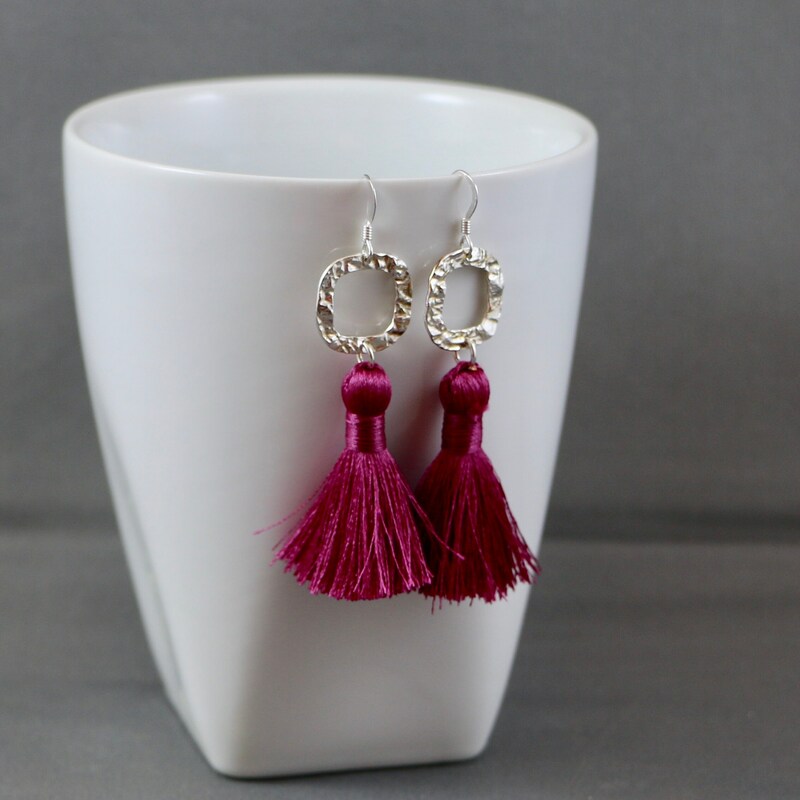 Earring Ingredients: A beautiful and silky polyester 1.25" Ruby color tassel suspended from a hammered silver rounded square link. Earrings are approximately 2.25" from end to end and have sterling silver ear wires. All payments must be fully received and verified before any items are shipped or custom created. •	After purchase and receipt of payment all items that are not custom requested designs will be shipped within 3-5 business days. •	After request for custom requested designs, we ask for 10-days creation time (+10 days for one re-work request) and once item is approved by the customer and payment is received the item will be shipped within 3-5 additional business days. •	Upon request and/or extenuating circumstances we will ship expedited shipments at an additional cost to the customer. •	DISCLAIMER: Allura Marie ships all items on time and is not responsible for shipping delays, lost mail or damages that can occur, especially for International shipments. If you purchase from us internationally, you accept all risks associated with the international shipments. All jewelry by Allura Marie Jewelry is created with the customer in mind and it is very important that all customers are 100% satisfied with their purchases. If you receive your purchase and feel that it is misrepresented by the photos shown on the site or your are just simply dissatisfied, please contact us within 7 days of receiving your purchase and we will happily exchange your piece for another or refund your money minus all shipping expenses once the item is received back. •	NOTE: All custom requested designs are non-refundable, sorry no exceptions. o	Allura Marie Couture Jewelry is guaranteed to be handcrafted with the great attention to detail and care. However, with regular care and wear your jewelry breaks within the first 30 days of the receipt of your purchase please contact us, ship the item back and we will repair free of charge minus the shipping expenses back to our business location. Upon completion of the repair Allura Marie will ship the piece back to you all shipping expenses paid by us. o	Allura Marie Couture Jewelry specializes in custom designs. If you have a specific design in mind that you are wanting created please let us know via either an Alchemy request or Conversation. The more specifics that you have in mind for your special design the better and easier it is for us to understand and create exactly what you were looking for. Once Allura Marie has created the requested design, we will be in contact with you sending you pictures of the newly created design to see if it is what you had in mind. We will only allow one re-work of a custom requested design. After the one re-work has been exhausted and there is still not exactly what you had in mind, the custom contracted design will be dissolved and the transaction cancelled. o	If you have any problems please communicate those problems through a Conversation via our ETSY site and we will try to resolve the issue in a timely manner. We do not like to receive or give bad feedback. o	We reserve the right to deny or cancel any purchase from buyers whom have had an issue or complaint with our service in the past.